First off, I want to say that I found Big Ideas Fest to be an excellent conference. All the main stage speakers were engaging and incredibly high calibre. I was particularly awe inspired by the day three rapid fire speakers. They launched the morning with incredible stories of success (Jason Young, Kylee Majkowski, Kristi Yamaguchi, Michael Sorrell). I would like to make a special call out to my K-12 teacher friends. This is the conference you should be looking at. Although it is rather US centric, there was so much to be learned by just being part of the design thinking process. The second day action collabs were setup to be based upon the number randomly assigned on your nametag. I was looking forward to this opportunity to meet more people and perhaps make some deeper connections. It was nice to go through the design thinking process again to re-enforce what we had learned on day one. Unfortunately, my group was very K-12 centric. The conference says K-20, and there was some talk from the main stage about inspiring college experiences, but the problems we were given to solve were all positioned in a K-12 setting. I found that I could participate and add my ideas to the conversation, but the problems and solutions that we were coming up with didn’t speak to me. In many cases, the best solutions I saw were very simple ones. In many cases the solutions were not innovative – but rather, simple small changes that could have huge impact. In some ways, I think these are the best solutions. They are truly actionable. 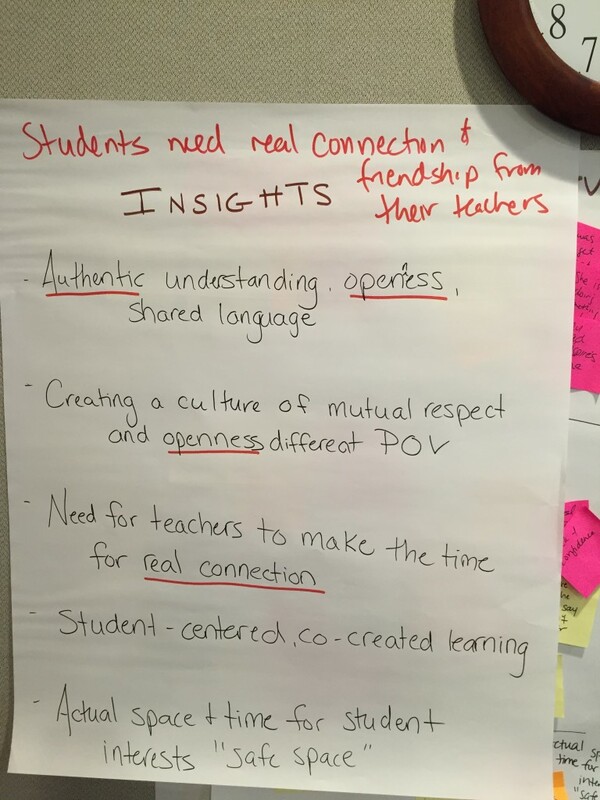 Our Insights after interviewing the students and reflecting on what we learned through that interview. 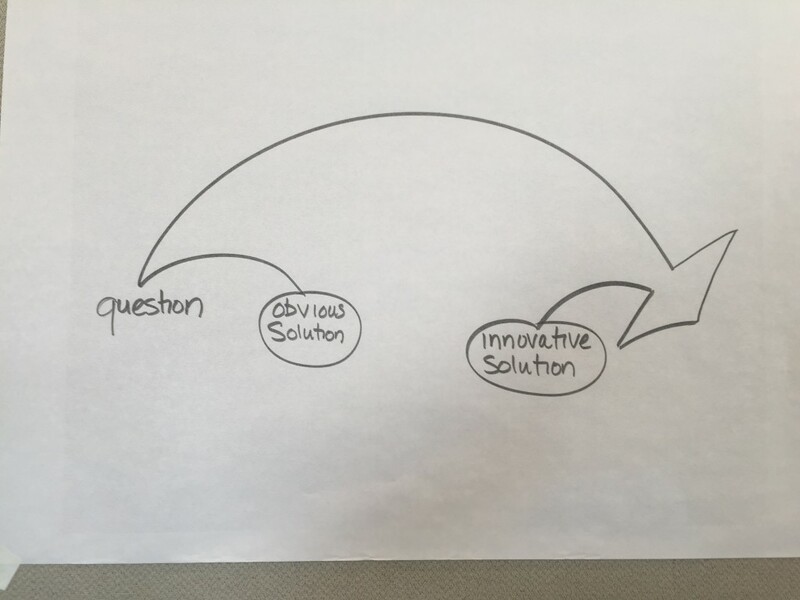 A fill in the blanks story model to help us better describe/explain what our solution was. It wasn’t until after the scheduled programming while I was debriefing the conference with my husband that I realized the source of my frustrations. The first full day (day 2), I spend working with amazing youth – but because I was working with youth in a context I completely did not understand, I had my youth advisor hat on. I wasn’t contributing my experience so much as I was helping the youth elevate their experience. Since I also didn’t have context or experience in the second set of action collabs, I also found that my experience wasn’t necessarily being heard. I found that people didn’t understand what I had to say. I contributed to the conversations but didn’t feel that there was a place for me to truly contribute. In some ways, I felt de-valued. After all the scheduled programming, I connected with someone while out walking. I found myself sharing my experiences of the last year and half with her. I felt like I was oversharing, but I also felt the need to do that. For the first time someone wanted to hear more about me. On the last day, I also made some new connections. Again, I found myself sharing my experiences. I felt like I could help people. I felt useful. I think there are two things that would have made a huge difference at this conference. The first was an opportunity to do introductions / checkins at our tables the first day. There was almost an assumption that everyone sitting together knew each other. In many cases, this was true. A lot of people sat with other people from the same school. Since I was there alone, without those ties, it meant that I didn’t know anyone I was working with. Beyond figuring out names, I didn’t have an opportunity to know or connect with the youth at my table. I would have loved to learn more than just their names and that they were all part of the same ‘club’ that brought them to the conference. There was an assumption that I knew about the Ever Forward Club and what it was all about. I didn’t. This was true the second day as well. It wasn’t until we were in a smaller groups that we had a chance to introduce ourselves (since there were only three of us, I insisted on the introductions before we started). It was in these smaller groups that we got to understand the different contexts we were coming from. These different contexts mattered. The context is important when trying to solve a problem. Understanding each others context helps us better communicate. It helps us understand when we aren’t speaking the same language. After spending the first full day with the youth from the Ever Forward Club, I found myself in a team with people who work in private schools ~ most of the teachers I met were from private or charter schools who had the budgets to send them to the conference. This was in deep contrast to the students who were coming from schools that didn’t have budgets. The contexts could not be more different. During the second day action collab my experience was directly discounted by our action collab facilitator. When she asked who might have expertise in the topic (we were looking for subject matter experts to interview), I mentioned that I had experience but in a college setting. She immediately dismissed me. I was shut down. I think that was part of what made my second action collab experience less rewarding (although I’m quite proud of the end solution – we spent a lot of time talking and going through different ideas before we came to something that we all liked). Our final action collab solution. My second recommendation relates to my being a lone person at the conference ~ I wasn’t there as part of a team needing to learn the process to help solve a problem in a specific context. As a lone person at the conference, I would have loved an opportunity to connect with other people working in higher ed. I happened across a few, but not many. The conference had a lot of people, so it wasn’t easy to happen across people from a similar context. I sat at a different table for every meal, so that I could meet new people. Unfortunately, I often ended up at a table with a bunch of people that already knew each other and were mostly interested in talking about how the learning of the day could be applied into their context. I was clearly an outsider. Not everyone wanted to draw me in and include me in their conversations (a few did, and I’m ever thankful to them for it). My suggestion would be to include some affinity groups during the unstructured time – especially when there are people who are not coming to the conference with a team. Examples might me those working in college or university, librarians, elementary, middle school, high school. Or, it could be a session on the first day, where we talk about ‘what are the big challenges’ within the different contexts. Or it could be a few ‘theme’ tables during the meals. I get that some people want/need the unstructured time. But in a large conference, those who are not already well connected could use a helping hand connecting. I’ve been to a lot of conferences. 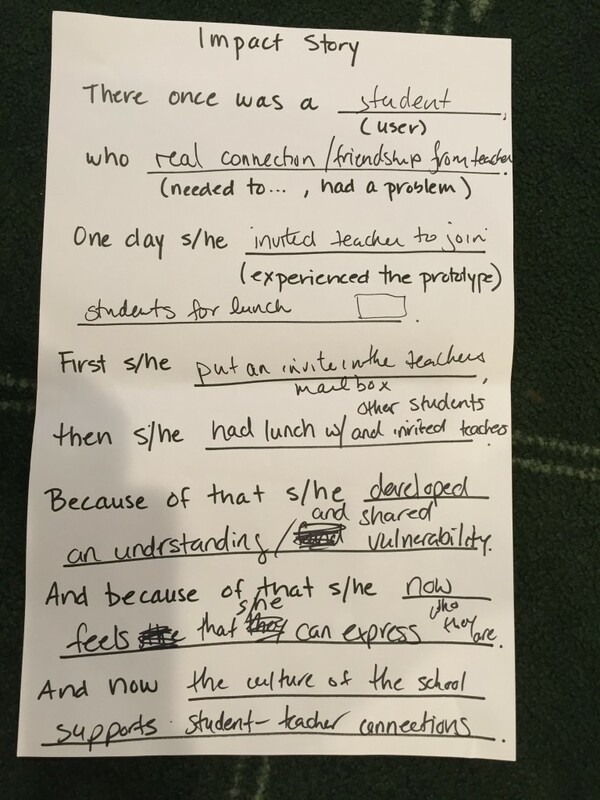 I’d love to see more Ed Tech conferences run full design thinking streams. I love the action collab process. 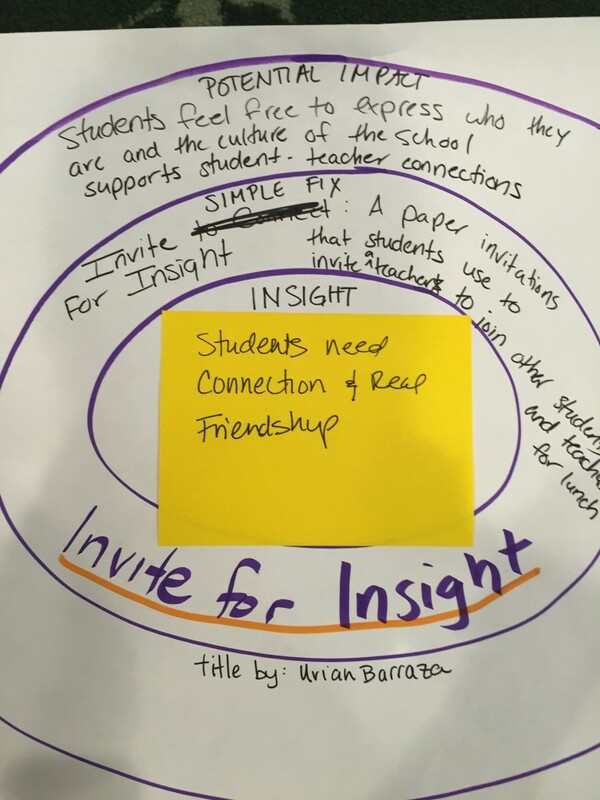 I love the ideas that were generated and the sometimes simple but very actionable ideas to help some of some the big problems in education today. Sometimes a small change can make a huge difference. I could easily see the process being used at an academic conference – however, the organizers would need to commit a stream of at least three sessions (three 60-minute time slots) to the process.